Coverage: Live radio and text commentary on all Andy Murray matches. Listen to Tennis Breakfast on Radio 5 live sports extra and the BBC Sport website from 07:00 GMT every day. British number one Andy Murray saw off German teenager Alexander Zverev with ease to reach the second round of the Australian Open in Melbourne. 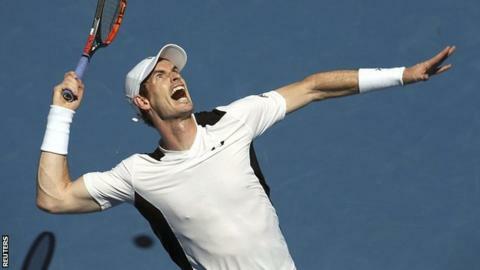 Murray, 28, dominated throughout against the former junior world number one to secure a 6-1 6-2 6-3 victory. The world number two will now face Australian Sam Groth, holder of the game's fastest serve, on Thursday. Murray joined fellow Briton Johanna Konta in the second round but Dan Evans and Aljaz Bedene both went out. Any news from home, Andy? "It got tough at the end and there were a lot of long games and rallies. Alex fought hard and made it very competitive," said the Scot. "It was hot so I was glad to get it done in three sets." Murray has said he will leave the Australian Open if his pregnant wife, Kim, goes into labour, although she is not due to give birth until February. "I don't have any news because I've just come off the court," he joked in his post-match interview. "I'm hoping my phone hasn't been buzzing in my bag but Kim will message the team if anything happens in any of the matches." Zverev, 18, is widely considered one of the game's rising stars but the winner of last year's ATP Star of Tomorrow Award could not match Murray's consistency in the first two sets. The 6ft 6in German, ranked 83rd in the world, improved in a final set that lasted almost an hour but Murray's experience was key. The Scot broke Zverev's serve six times, saved six out of six break points and dominated when he came to the net, winning 12 points, to seal victory in just over two hours. Dan Evans' first appearance at the Australian Open ended in a 6-1 6-0 6-4 defeat in 88 minutes by Spain's Feliciano Lopez. The 25-year-old came through three rounds of qualifying but could not cope with Lopez's powerful serve. Evans made a better fist of the final set and held his first four service games but could not make any impression on the Spaniard's serve. British number two Aljaz Bedene was unable to overcome American 31st seed Steve Johnson and fell to a 6-3 6-4 7-6 (7-3) defeat. Bedene, ranked 49th in the world, said he found the speed of the Melbourne courts difficult to handle. "I didn't really settle. It was way too quick for my game," said the Slovenia-born player. "I don't really like the quick surfaces like here. I am disappointed."